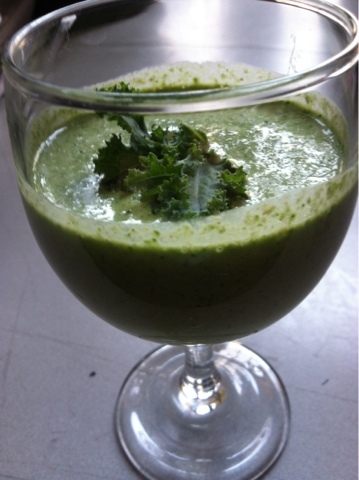 This is my third and final day of the Green Smoothie Queen's 3-Day Green Smoothie Challenge. Tera has been an excellent greens guide, hooking me up with great new recipes, new ways of looking at eating and kick-starting me off to a great and healthy spring. Check out these delicious-looking raw food CUPCAKES on her site! You all know what a sweet tooth I have. Today's yumbliness--walnuts, coconut milk, kale. I had already concocted one earlier with beet juice, tons of kale, arugula, yellow grape tomatoes and maca. Just needed a bit more protein with a little chew factor to get me through my next deadline. Yesterday, the challenge was a bit of a, well, challenge. We attended a welcome-home brunch out in Jersey for a dear friend, and while the idea of bagels and lox wasn't going to knock me off my quest for mean, clean green-ness, initially I did feel a little funny taking my Mason-jar-encased greenies out of the bag I'd brought from home and consuming them at the table! As it turned out, one guest was entering upon a doctor-prescribed allergy food-elimination cleanse today, Monday, the host-hubby had helped his wife become green and clean during breast cancer chemo last year and the guest of honor has been a long-time vegan. It also gave me something to talk about, allowing me to share my green journey with like-minded health-pursuing individuals! Ahhhh. Audible sigh of health + happiness. Your Happy Greens Goddess Kim!